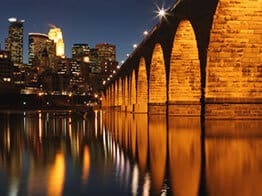 Minnesota got its name from the Dakota Indian tribe word for “clear water”, which is Mnisota. Give that word to a large group of Scandinavian and German settlers and it comes out Minnesota. Our Native American brothers and sisters named a lot of states. The Minneapolis and Saint Paul metropolitan area is home to 3 out of 5 Minnesotans. This is the best place to ship your car fast and at the most competitive price. Check our auto transport quote calculator to see your rate. The other 2 out of 5 Minnesotans are spread all over the prairie and north to the Canadian border. That makes it hard for Minnesota auto transport in many areas, certainly in the northern stretches of the state. The Land of 10,000 Lakes is almost the last stop for the Midwest States. To the west are North Dakota and South Dakota where not many folks reside. Directly south is Iowa, but northern Iowa is sparsely populated as well. To the east is Wisconsin and more of the same, wide-open farms and country roads. So the Minneapolis area is the hub of auto shipping activity in the upper Midwest. Interste I-94 travels southeast from Fargo, goes through Saint Cloud and then on to Minneapolis, Saint Paul, Bloomington, Brooklyn Park, Maple Grove, Edina, Minnetonka, Blaine before crossing east to Wisconsin. Interstate i-35 starts considerably north in Duluth, cuts south through Minneapolis and straight as an arrow to Iowa. That makes Duluth approachable, but never the less very difficult for auto transporters because it is not really a big enough town to normally attract 8 to 10 vehicles on a car hauler. Patience is a virtue in Duluth. Farther south is I-90, which traces the southern border with Iowa. Sorry to say folks, that highway is just passing through and there isn’t much along the way to make a trucker stop. Maybe Rochester, which is a stone’s throw off I-90, will get some Minnesota auto transport shipments, but really it’s slim pickings. The western part of Minnesota and most definitely the middle and northern regions of the state are extremely difficult to ship a car in a timely fashion. It is so spread out and seldom is there several vehicles in any one area going to any other centralized area. It is frustrating for you the customer, and of course the auto shipping company as well. We recommend meeting a driver in the Minneapolis area. Get your vehicle there if you can. And if you can’t, well chances are that an auto transporter will eventually be coming through your remote town, and guess what? He will be as happy to see you, as you are to see him! But you need to be patient. Our car shipping quote calculator makes the entire process of shipping a vehicle so much easier. And once you see your Minnesota auto transport rate then just go ahead and book it online. If you are still unsure about what to expect in Minnesota for auto transport services, then please call our customer service line at 800-600-3750 to get still more advice on what to do. You can also visit Direct Express Auto Transport to fill out a simple form and get a free car shipping quote. We make it easy to book your vehicle shipment online.